There are at least three major types of Water Chestnuts: Chinese, European and Indian. There are other Chinese Water Chestnuts (such as the ones termed “European” below), but type described here are the ones most of us are most familiar with today. First, they aren’t nuts — they’re “tubers” — the root-like part of a rush-like plant that grows in fresh water. (Granted, their brown skin is kind of chestnut in colour.) The almost turnip-shaped tubers grow near the bottom of the pond or stream and are harvested from the water with forks. The Chinese treat these as a vegetable; they peel them and slice them and cook them up. UK Customs also consider them a vegetable, and not a nut. Who can blame us though for thinking all these years they were nuts: the cans said “nuts”, and they were already sliced up so we couldn’t see what they looked like before. You mean, they don’t grow sliced? 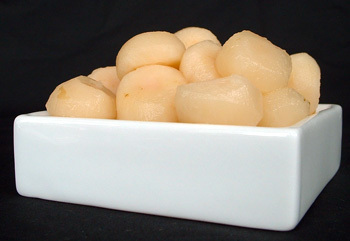 Rich in fibre, these Water Chestnuts have a starchy but neutral taste to them and have a satisfying crisp, firm bite. They don’t all come from Asia anymore: some Florida growers are reporting success with cultivating these. And once those Florida people get started: watch out. Next thing you know, they’ll have Anita Bryant drinking Water Chestnut juice. The Chinese call these matai, pi chi, or pi tsi. But pay attention to the scientific name, “Eleocharis dulcis” (and sometimes Eleocharis tuberosa), as it’s going to be important for the next bit. These aren’t actually just European Water Chestnuts, but we’ll use that term for convenience. This variety is called “trapa natans” by botanists, so you can see right away by the very different scientific name that it’s a very different creature from the “Chinese” Water Chestnuts. For starters, it actually is a nut. These Water Chestnuts have been around for a long time in Europe. They were found in those now-legendary Swiss neolithic dwellings whose garbage piles were the object of much funding and study, where peas were also found. The variety has been in Europe since at least the Ice Ages. However, it’s now rare in Northern Europe; it’s completely extinct in Scandinavia, and people in the UK struggle to cultivate it. For the most part, it has retreated to warmer parts in Southern Europe, where even there it is considered endangered and has been designated a protected plant. Its decline is probably due both to colder weather and to over-harvesting by man. In Germany, it was honoured on a stamp in 1981. In Italy, it is used in some popular risotto recipes. This variety is native to Asia, where it is used in cooking. Many South-East Asian countries import this Water Chestnut from China for food. In both Asia and Europe, the nut is often eaten raw, though more usually it is boiled or roasted. Fast forward to North America. This Water Chestnut variety was first noted in North America in 1874 (though one of its names, “Jesuit Nut”, may indicate an earlier introduction.) By 1879, it was growing as an escape in the wild. It quickly proceeded to take over waterways in the North-Eastern United States; so much so that it is considered a noxious weed upon which millions upon millions have been spent in eradication attempts. The plants are clogging up the surfaces of waterways, creating a hazard for recreational boaters and cutting off light into the water for other plant species. The nuts are a problem in themselves. Though these “chestnuts” have the same colour as chestnuts, they actually aren’t anything as benign as the chestnuts that kids bean each other with. They have sharp, very strong barbed-spines on them (usually 4) that can pierce even leather-soled shoes, never mind unprotected feet, and make beaches and wading quite dangerous. They actually look quite demonic, with a little face and horns on them. A name for this plant in Europe is “Water Caltrop”, as the nut resembles the nasty weapon called a “caltrop” used in the Middle Ages to maim the feet of charging horses. How the plant reproduces is as it dies each year (it is an annual), it drops the horned-nuts to the bottom of the pond or stream where they spend the winter. A nut can lay dormant there, researchers believe, for up to 12 years. When it sprouts, it will grow a plant with 15 to 20 flowers on it, with each flower then producing 15 to 20 chestnuts. One acre of the plant will produce 100 acres the next year. The government people trying to control it are at wit’s end. They think they’ve removed it all from an area, as a few clear years will pass, and then dormant seeds hidden in the mud at the bottom of a pond will come to life, and within two or three years the whole area is covered again. The plant grows in the water, where its large leaves float on the surface (though sometimes it will occasionally grow on shores near water, making the government tear its hair out thinking that it’s evolving and becoming amphibious.) The hull of the nuts will be chestnut brown or black. The husks inside will be either green, red, or mottled red and green. The actual nut at the centre of all this will range anywhere from 1 to 2 inches (2.5 to 5 cm) wide. It is illegal to even plant these in many states. The solution, however, may be to stop trying to eradicate them, and instead encourage someone to export them to South Asia — or encourage local people to eat them. A few years of commercial interest in this plant should go a long way to knocking it off. North Americans who have tried them say they like the taste, comparing them to crunchy, juicy little coconuts. Again, these aren’t actually just Indian (as in India); they are actually popular throughout South Asia. These are a good deal like the “European Water Chestnut”, but they have fewer spines on them, usually 2. Many farmers in India are encouraged to grow them as cash-crops; they’ll grow fish in a pond for half a year, then these chestnuts in their ponds for the other half. They are considered to be tastier than the “Chinese Water Chestnut” which is a tuber. In India, they are called singhara (or singara) nuts. The Latin name is “Trapa bisponosa”, so you can see how they are related to the “European” Water Chestnuts (and like them, they are actually nuts, not a tuber.) The “bisponosa” part of the name means “two-spines”, as in just two of those dangerous-looking pokey-out things instead of four like the “European” Water Chestnut above. When using in uncooked dishes or in stir-fries, you could try substituting raw, sliced and peeled Jerusalem artichoke or Jicama, fresh or tinned. Crosne. Sodium level will depend on the brand if canned. Store either fresh Water Chestnuts or opened canned ones in a bowl of water in the fridge for up to a week; change water daily.